In the first guide, we've laid the groundwork for our ultimate goal of loading and running the unix-privesc-check script on our target. We have identified an input field that is vulnerable to SQL injection and used Sqlmap to set up a file stager on the server. Now we can upload files and run the script to identify any misconfigurations that could escalate privileges. 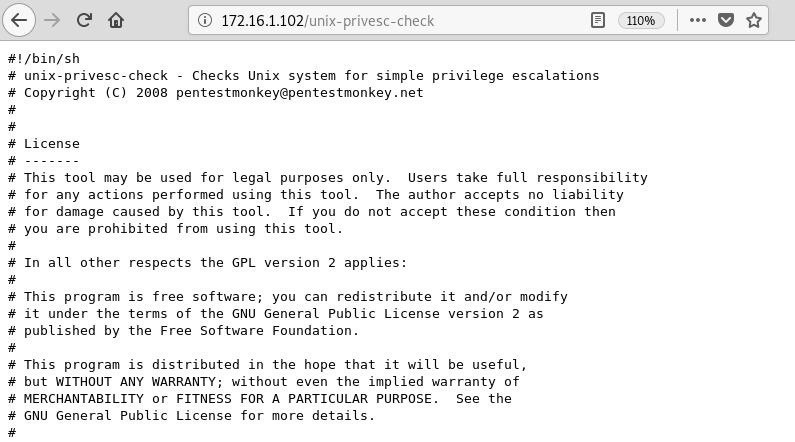 The unix-privesc-check script is a bash script that runs on Unix systems and attempts to identify misconfigurations that could allow privilege escalation. It can be executed either in standard mode (speed optimized) or in detail mode (even more). The default mode still looks for many things, including file permissions, user permissions, SSH keys, and other security settings. The detailed mode is more thorough but slower and may be prone to false alarms. First, we need to find out where the script is located in our file system. You can search for this file with the command locate . /var/lib/dpkg/info/unix-privesc-check.md5sums[19659007AlsoasthatasoaseriesofresultsincludingdocumentationrelatedimagesandbinaryfilesbutthebuttablefileistheBashScriptDirectory / usr / share / unix-privesc-check / . Now that we have the location of the script, we can return to our file stager and search for it. After selecting, click the "Upload" button and we should see that the file has been successfully uploaded. If you do not know which button I'm talking about, be sure to read the first part of this guide, because you need to know what's going on in that part. But wait. It seems that the only thing that happens is that the script itself appears in the browser window, which we do not want. For the script to execute, commands within that directory must be issued. Fortunately, we can do this with a simple PHP script. This one-liner uses an operating system command as the parameter and runs it on the underlying server. We will use this to execute our script. For example, issuing the command uname -a returns operating system information. Now that we know our command shell is working, it's time to start the Unix Privesc check script. On Unix systems, the dot slash (./) is used to execute executables in the current directory. This refers to the relative path to something and essentially allows the execution of files in directories that are not contained in the environment variable $ PATH. We can then tell what we do command shell to run the script with the above in the URL. Now we can see that the results fill the browser window. This script verifies a variety of things, and although we can see the results, it is not very useful when we connect lose or check our results later. It would be more helpful if we could send the results back to our own machine. One method we could use is the handy Netcat tool. Netcat is a utility commonly used to troubleshoot connectivity issues in networks . It works over TCP / IP and can be found on many systems. Hackers often use Netcat as a backdoor or as a means to create shellfish. We can use this powerful tool to send the output of our script over the network and save it to a file on our local computer. The first thing we need to do is open a listener on our computer. We can do this with the command nc and the switches -lvp stating to hear in a particular case literally on a selected port, 1234 . Then we use the redirect symbol (> ) to place in a file named results.txt . Local users to extend permissions. Condition applies the GPL v2. This script has not found any problems. In this tutorial, at the point where we stopped in Part 1, we looked and uploaded a script using sqlmap, to look for ways to increase permissions on the target. However, we had to do a few things to make it work properly, such as uploading a command shell to actually execute the script. We also learned how to use Netcat to transfer the output to a file on our local computer for later use. This attack scenario is just one of the many ways hackers have systems in the wild that show you can never be too creative with this craft.